Mobility — the ability to move or be moved freely and easily. It’s something most of us take for granted. But for thousands of the physically disabled poor living in developing countries, the chance to move around or be easily moved by others is tragically not a reality. Which is why the nonprofit group Free Wheelchair Mission sends volunteers to developing nations every year to literally help others get off the ground for good. September to Vietnam. Once there, she and the six other volunteers in her group built and distributed 320 wheelchairs to those in need. The group started in Saigon and then drove to small towns in Southern Vietnam where eager recipients of the wheelchairs awaited them. A local pastor prepared for their visit by working with the Red Cross to identify those in need in each community, and then coordinated a gathering place such as a church or city hall. Among the recipients, some had lost limbs to diabetes and car accidents. Others had congenital defects. Many were injured during the war. Sandy and the rest of the group were warmly greeted at each stop with homemade delicacies, including noodle soups, papaya salads and various meats. Because most residents in the area drive motorcycles, special instructions were given on how to transport the wheelchairs home for their recipients. 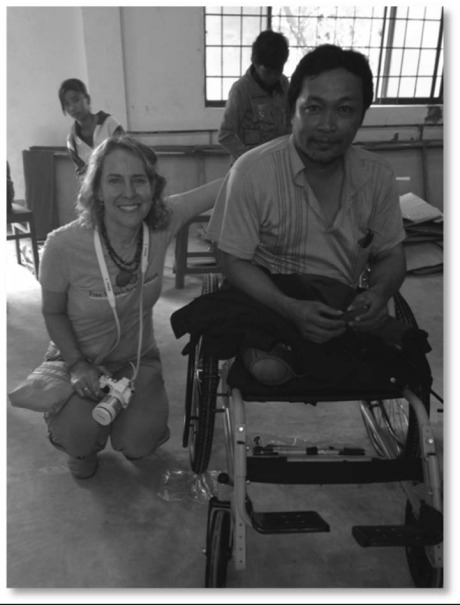 This wasn’t the first time Sandy has traveled to distant lands with Free Wheelchair Mission. In 2013, Sandy and her daughter, Ana, went with the group to El Salvador to build and deliver wheelchairs there. You can learn more about Free Wheelchair Mission by visiting www.freewheelchairmission.org or calling 1-800-733-0858. They are the ladies who lunch. But these are no ordinary ladies, and their regular get-togethers provide more than just an afternoon meal. Every other month, a very special group of women – all of whom live in the Riviera on Calle De Castellana – meet for the Senior Ladies of Castellana Club. Created by long-time resident Johnette Colman, the purpose of the club is to provide friendship, companionship and a sense of community among the senior ladies who call this unique street home. The Senior Ladies’ Club meets at Johnette’s home for their potluck luncheon. Special holidays might find them at a nearby restaurant. Ranging in age from 60 to the mid-90s, almost all the ladies in the Club have lived on Calle De Castellana’s one-block street for decades. After eating, the group usually takes turns sharing on that month’s theme, such as memories of school days for the month of September or reflections on their moms for Mother’s Day. Johnette also provides folders containing information from Torrance Memorial Hospital Health Links dealing with aging problems such as memory loss, hospice care, strokes and other subjects. Birthdays are always celebrated with a cake, card and “Aged to Perfection” sign posted in their front yard. Younger women on the block are often invited as guests. One of those younger women is Cathy Hachigian, an honorary member of the Senior Ladies’ Club and the woman the senior ladies call their “guardian angel.” Cathy makes the luncheon fliers that Virginia then distributes. Virginia also provides transportation to the luncheons for those ladies who have trouble walking. The Senior Ladies’ Club is just one of the happenings that make Calle De Castellana so unique. The first Friday of each month, the streets’ neighbors gather outside to mingle while their children play together. And twice a week, several ladies on the street meet on one of their front yards for an invigorating work out. Starting the Senior Ladies’ Club was a natural for Johnette because giving back to others is in her blood. Her parents were missionaries in Honduras, so she learned from a very early age the importance of doing for others. Prior to starting the club she was a volunteer at Torrance Memorial Hospital for many years. 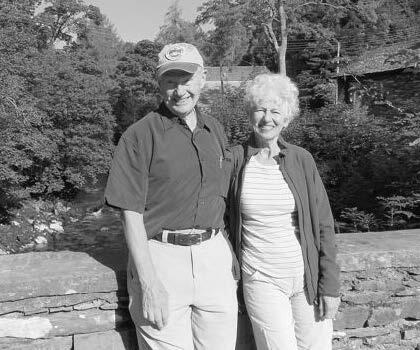 Saint Augustine once said, “The world is a book, and those who do not travel read only a page.” If that’s true, Jane and Jerry Kreutz are voracious readers. As the owners of AB Travel, the Kreutz’s know first-hand the joys of exploring lands near and far. Jane started her career in the business back in 1972 when she became a travel agent and eventually executive vice president for Alpha Beta (for those too young to remember, Alpha Beta groceries – now Albertson’s – once had travel agencies in many of their grocery stores). Prior to that Jane was a stewardess with Continental Airlines, so she already knew a thing or two about travel. 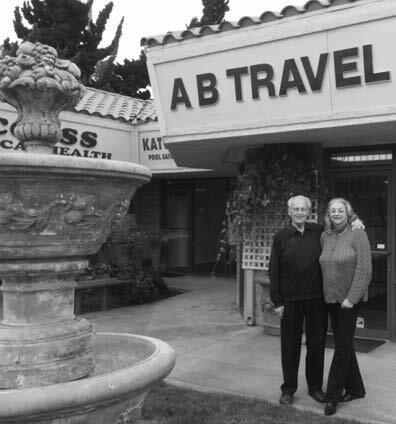 In 1982 Jane bought AB Travel, which has been located in the shopping center at Vista Montana and Pacific Coast Highway (behind the Mongolian Barbeque restaurant) since 1976. Jerry, her husband of 49 years, joined her in the business when he retired from Hughes Aircraft 25 years ago. Among Jane’s favorite travel destinations are Canada, New Zealand and Kenya. While cruises are still a very popular way to travel according to Jane, riverboats are becoming one of the most requested travel vacations. In addition to cruises and riverboat trips, the Kreutz’s arrange independent land-based trips all over the world. After so many years in the business, the Kreutz’s have seen a lot of changes in the travel industry, especially with the widespread use of the internet to research vacation options. Jane and Jerry have lived in the same house in the Hollywood Riviera since 1965, and have two grown children and 4 grandchildren. And though they’re sure to hit the road for more travel adventures, they plan to stay rooted in the Riviera permanently. You can visit AB Travel at 24022 Vista Montana, Suite B, Torrance or call them at 310-373-8631. Relay for life raises funds for the American Cancer Society with the help of teams of volunteers who commit to having at least one team member walking on a track at all times over a 24 hour period because cancer never sleeps. The event honors cancer survivors, pays tribute to those who have lost their lives to the disease, and raises money to fight cancer. This year’s theme is “California Dreamin’ for a Cure,” and the goal is to raise $275,000 for the American Cancer Society. The Hollywood Riviera Sportsman’s Club is fielding a team again this year, with Igor serving as team captain for the 9th year in a row. Please consider joining the Riviera Sportsman’s Club’s Relay team if you’d like to get involved (women and men are welcome). The team raised $12,000 for the American Cancer Society last year, and hopes to exceed that amount this year. 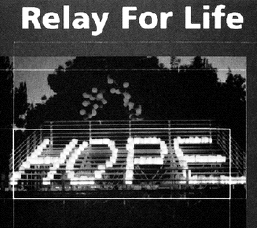 Relay for Life began in 1985 with the vision of Dr. Gordy Klatt, a colorectal surgeon in Tacoma, Washington. In an effort to raise funds for his local American Cancer Society, Dr Klatt spent a grueling 24 hours circling the track at the University of Puget Sound, logging in more than 83 miles. Nearly 300 of Dr. Klatt’s friends, family and patients cheered him on as he walked, while others donated $25 to walk 30 minutes with him. Ultimately, he raised $27,000 to fight cancer. The following year, Dr Klatt organized 19 teams to take part in the first team relay event, and a total of $33,000 was raised for the American Cancer Society. Today, Dr. Klatt’s vision is a fundraising phenomenon. Highlights of the Relay for Life are the opening ceremony Saturday, April 26 at 9 am followed by a survivors’ lap at 9:30 am. At 8 pm Saturday, a Luminaria Ceremony will honor survivors as well as those who lost their battle with cancer. The luminarias burn through the night to light the path for those walking to fight back against cancer. You can purchase and decorate your luminaria at the event on Saturday. Entertainment is provided throughout the event, including headliner band Russell Somers & Friends and performances of Bollywood and traditional Filipino dances. The event concludes Sunday at 9:00 am with a closing ceremony. To sign up for the Hollywood Riviera Sportsman’s Club team, or to donate funds, please contact Igor at 310-892- 6016 or inastaskin2@socal.rr.com. You can also mail your donation, payable to the “American Cancer Society,” to Igor at 601 Calle de Arboles, Redondo Beach, CA 90277, and he will forward it to the American Cancer Society. Please mark on the memo line “Relay for Life of Torrance.” Or, you can donate to Relay for Life and/or join the Hollywood Riviera Sportsman’s Club team online at www.relayforlife.org/torranceca. Donations are accepted until August. It is not a job for everyone. The hours are long, the work is stressful and to top it off, it is one of the most dangerous of all occupations. But for those called to serve their community, working in law enforcement yields rewards beyond compare. Al started his career in the Sheriff’s Department working in the jails, followed by patrol at the Lennox Sheriff’s Station, where he spent nine years as a patrol deputy and detective. He then worked Special Investigations and Metro Detail, where he dedicated his time to complex cases involving kidnapping for ransom, extortion and solicitation for murder, as well as prison escapes and high profile stalking cases. After being promoted to sergeant, Al supervised teams in the Major Crimes Bureau. Shortly after he was promoted to lieutenant, and began overseeing teams at Operation Safe Streets, which targets gang activity in and around Los Angeles and Compton. Over the years, Al has seen his share of human tragedy, including murders. But then there are the moments of triumph, such as the time he helped rescue an elderly kidnap victim and bring his tormenters to justice. Al and his wife, Tammy, have lived in the Hollywood Riviera since 1993 and raised two kids in the area. His mother and aunt also live in the Riviera. Al first learned of our unique community from his sergeant, who is also a Riviera resident. He’s an active member of the community, including the Hollywood Riviera Sportsman’s Club (where he served as president) and the Redondo Elks Club. He also coached youth sports and was involved in overseeing Boy Scouts activities. 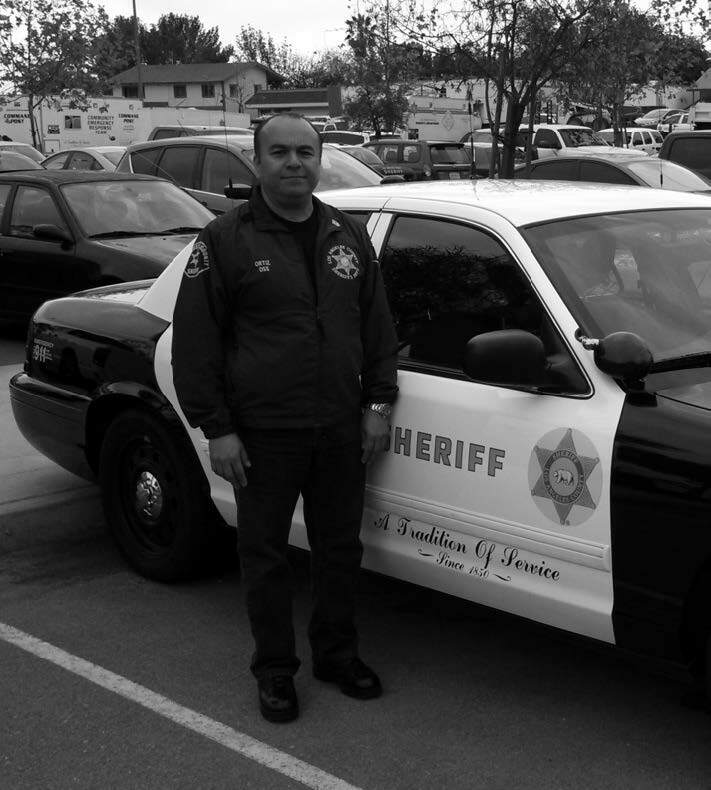 He is currently the president of the Hispanic American Police Command Officer’s Association, Los Angeles Chapter. Thank you Al, for your decades of service keeping our communities safe! Kirk Rossberg has a sweet tooth, and that’s a very good thing. After all, the Hollywood Riviera native has worked his entire life surrounded by sugary treats. His first job, at the age of 13, was at a confectionery shop in the Riviera Village called Edelweiss candies. When that business moved he took an after school job at a nearby bakery and quickly realized cakes were his calling. You can still find Kirk surrounded by delicious desserts, but today it’s at Torrance Bakery, the business his family has owned and operated since 1984. Located in downtown Torrance, the shop started with eight workers and today employees 89 people in its two locations (the second bakery is in Gardena). It’s easy to see (and taste) why Torrance Bakery is such a success. Hundreds of customers visit the bakery every day for their scrumptious goods, including freshly baked donuts, cakes, brownies, cookies, cinnamon buns, muffins and more. And those creamfilled fried croissants the nation has been clamoring for recently? Torrance Bakery has been making them for years. The bakery also serves lunch items such as soups, salads, and sandwiches made on freshly baked bread. The cake artists at Torrance Bakery are like Da Vinci’s with pastry bags. They can create just about any cake décor their customers dream up, including replicating decades old wedding cakes for 50th anniversaries. Stop by Torrance Bakery around Valentine’s Day and you’re bound to see cute little Love Bugs (white cake covered in white chocolate ganache with a red tint) and Valentine Whoopie Pies (butter cream-filled chocolate cake). Closer to Saint Patrick’s Day, customers can pick up Blarney Bugs and Shamrock Whoopie Pies, including the ever popular red velvet cake filled with cream cheese. Cakes commemorating the Super Bowl, the Oscars, Mardi Gras, prom, graduation and more are also popular. Kirk does more than just oversee the family business. He also rolls up his sleeves and is a very talented cake decorator himself. In fact, he occasionally teaches a cake decorating class through El Camino Community college. Kirk grew up in the Hollywood Riviera and lives on the same street as his childhood home, near his parents and other relatives. 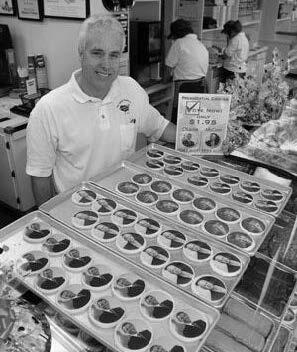 Stop by Torrance Bakery at 1341 El Prado Avenue in Old Torrance and say hello to Kirk. And while you’re there, bring in this newsletter for a free chocolate chew cookie. Your taste buds will thank you. When Winston Churchill spoke those words he may as well have been speaking about Dave and Toni Sargent. These long-time Riviera residents are wonderful examples of the saying, “live to give,” and the result has been much joy in their own lives. The Sargents moved to the Riviera in 1962 to be close to Dave’s engineering work at Northrop Corporation and later TRW. The two met in England just the year before when Dave, who was temporarily working at the University of Manchester, looked across a crowded cafeteria and caught eyes with a gorgeous young woman. After a whirlwind romance, Dave and Toni married a few months later in a small chapel on the site of his alma mater, Cornell University, in New York. In recognition of their extensive volunteer work the Sargents were honored this past summer with the distinguished Jared Sidney Torrance Award, our community’s highest honor. Their list of volunteer achievements is so extensive there isn’t room to list them all here, but we’ve highlighted a few. Dave’s volunteerism started more than 40 years ago when he served as Nation Chief on his son’s YMCA Indian Guides group and then as a local AYSO Division and Regional Commissioner. He joined the Hollywood Riviera Sportsman’s Club in 1977 where he has served in many capacities, including President, and is still an active member. He has also been very involved with the Torrance-South Bay YMCA. A long-time education advocate, Dave was elected to the TUSD Board of Education in 1983 where he served in many leadership roles, and has also been president of the Torrance Education Foundation board. He is an active member of his church, St. Luke’s Presbyterian, and joins his wife on the Miracle of Living Committee at Torrance Memorial. His most recent civic duties include serving on the Torrance Traffic Commission, including one year as Chair. Dave and Toni often help each other in their respective volunteer capacities, which is a good thing because Toni is just as active in the community as Dave. With three children all attending our local schools, Toni was intensely involved with the PTA for more than 30 years. She has been on the boards of numerous organizations, including the Salvation Army, The Torrance Historical Society and Las Vecinas Women’s Club. She was also the first Chairman of the Torrance Branch of the American Heart Association. Three years ago she was appointed by the Torrance City Council to the Torrance Library Commission and is presently serving her second term as Chair. She is also actively involved with the Riviera Garden Club, and volunteers with the Torrance Farmers Market, which she helped start 29 years ago. Toni and Dave were faced with a devastating tragedy in 1985 when their 19 year old son, Jonathan, committed suicide. Toni channeled her grief into organizing a fund through the Torrance School District for suicide prevention, and has been very involved with suicide prevention presentations and grief counseling in the community. She has appeared on national television and radio speaking about suicide prevention, and is still involved with the Los Angeles Suicide Prevention Center. Three years after her suicide prevention work began, Toni was appointed by County Supervisor Deane Dana to the Los Angeles County Task Force to Promote Self-Esteem and Personal and Social Responsibility, and was also appointed to the Drug, Alcohol and Tobacco Education Committee. Today, with two grown daughters and two young grandchildren, Dave and Toni are still not the type to sit on the couch and watch the world go by. They travel, exercise, go to the theater and of course, volunteer.